Greetings everyone, our apologies for not keeping up to date with social media postings. It has been a busy season so far this year, but we're going get you spun up with what has been happening, and what is in the pipeline for the next month. After returning from Wilderness First Responder training in Colorado, there was a mad dash to get our trees in the ground, putting us at 271 bare roots ranging from currants and josta-berries to hazlenuts and sycamore. By incorporating more refined perennial systems, we can focus efforts in other places on the farm such as community engagement. This past week, we wrapped up a two-week long intensive with interns from the Rubenstein School, focused on field ecology and community engagement. **in a time of global uncertainty within climate, politics, overall health & well-being, it is a bit of fresh air knowing our youth is fired up to make changes in life that support environmental & social diversity. I am truly honored to have had yet another opportunity to view this first hand. Thank you. Last month, I had the pleasure of attending a week-long training in New Hampshire sponsored by the National Center for Appropriate Technologies. Their Armed to Farm program is intended to engage veterans interested in or who are already involved with farming. It is always quite a humble feeling to be with others who have found purpose and understanding within the landscape after their discharge from the service or after returning home. It is in these moments, that an overwhelming sense of gratitude arises towards those who support us without judgement and encourage the vet population to move forward beyond all barriers, so that we can continue to serve our community. Farmer Training Program from UVM, invited Wild Roots back to speak with this years participants on veterans in agriculture. There were only a few vets in the program, but more than 65% of the room had close relations with someone who had served. The Veterans Homestead Series continues after Wild Roots hosting a carbon farming workshop & Headwaters Farm hosted a systems diversification workshop. Lucas and Sabrina Papineau from Papineau Family Farms will be leading the next on Sunday July 29 from 10-2 in Highgate to discuss pastured poultry systems and portable coop design. **This event is free and open to all vets, family of vets and care providers/ service organizations that work with vets. We lit up the pizza oven a few times in support of our wood-fired discussions. Joshua Faulkner and Jenn Colby visited from UVM Extension to discuss climate adaptive practices, soil health and pasture management. **Our next discussion is on Thursday August 2 from 6-8, with Farmer Jon to discuss Regenerative Systems on the Homestead. This event is $8 and open to the public. Most recently, we co-hosted an event with SunCommon as part of their five-towns solar initiative, and had the great pleasure of bouncing in the solar-powered bouncy house, listening to some fine banjo-picking and fiddle-playing, and filling our bellies with fixins from the garden & watermelon. The upper gardens have been supplying some high quality produce while the lower gardens are brewing up our storage crops. We are prepping to put in a new high tunnel with funding from EQUIP/ NRCS, that will allow us to extend our growing season into the colder months and get a jump in Spring. Lastly, our scheduled workshop for this weekend with Kate Elmer from Spoonful Herbals has been cancelled in observance of a passing in the community. We are rescheduling for sometime in August and will post a date as soon as it is made. We hope that these updates are helpful, informative and embraced. We acknowledge that Wild Roots and our work has been recognized on many levels and remain incredibly grateful & humble for this alone. We do not aim to show you how good of a job we do, but hope that you or someone you know, will be inspired to take action and make changes that support the vitality of your community or self. Plenty of mistakes have been made in the field or among our peers- these are teaching moments that provide vital feedback necessary to help us evolve and better serve our mission. Regardless of opinions, beliefs and preferences, community is the most important thing we have. Wild Roots strives to support forward motion in systems thinking and social regeneration through agricultural solutions. With a prolonged period of warmer weather, we have been able to wrap up those last minute tasks without worry. Designs for next years crops are being finalized and we are planning to add an additional 300 shrubs and trees for berries and nuts while providing a multi-purpose windbreak with food and habitat for song birds and pollinators. We are coming to a close working with our 5th semester of students from the Rubenstein School of Environment and Natural Resources. I continue to be amazed by the enthusiasm they share to improve & regenerate the natural world. This semester's project consisted of two gardens that will provide forage all season long for our native pollinators. Designs will be posted in the coming weeks. In just two weeks, Wild Roots Farm Vermont will represent organic/ regenerative farmers on a community panel to discuss land conservation, water quality and farm viability. 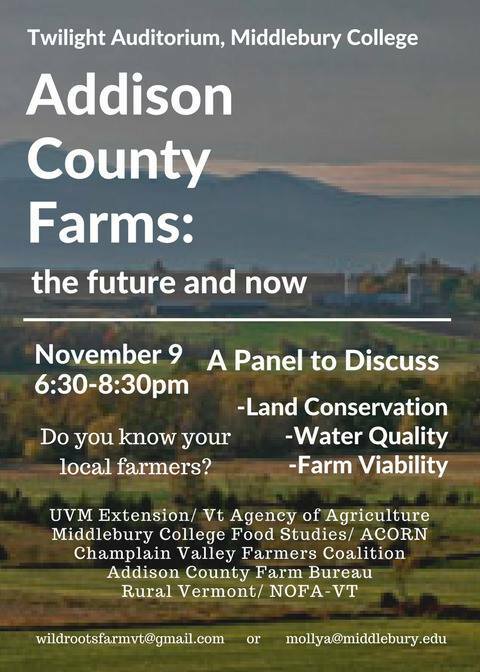 This event is intended to engage community about various farm practices in Addison County and meet their local producers. The event is on Thursday, November 9 from 6:30-8:30 pm at Twilight Auditorium on Middlebury College Campus. Doors open at 6:00pm and light refreshments will be served. This event is open to the public. As this season comes to a close, it is most appropriate to offer gratitude for the harvest, support, and potential for our site. In the two short years Wild Roots Farm has been in existence, we have had the great pleasure of working with several hundred community members during it's development. In doing so, we have expanded our abilities to educate our youth, allowed time and space for college students to utilize various design principles for developing resilient food systems, and offered the opportunity for veterans to find a greater sense of self and purpose after their time in service. With each group that visits for a class tour, workshop or volunteer workday, we are clear to state that every component of our farm and every practice that we implement, is designed to improve the health and vitality of our community (from soil to wild beast). We believe that by providing a space for community to gather, get their hands dirty, view the landscape from an ecological perspective and share a meal, will only help us to develop a greater sense of purpose in our lives and encourage us to move beyond the narratives that have kept us from reaching our potential as human beings. We use hand tools and good 'ole sweat equity with the occasional usage of modern day technology (weed-wackers at times) to get things done. Copious amounts of bio-mass (compost, manure, wood chips and hay) have been placed onto our beds with cover crops, to increase biological activity and organic matter in the soil which allows us to not have to water our crops even after three weeks of Vermont drought-like conditions. Animals are rotated regularly to prevent overgrazing and compaction while offering fertilizer and food.Tree crops are placed on contour and the strips between the tree lines are filled with a cocktail of cover crops for forage. We do not seek a competitive edge or believe that every action performed is most efficient. Mistakes have been plenty, but are viewed as learning opportunities that will allow us to share what works and what doesn't given the circumstances and resources available. We choose to live this way because it aligns with our vision of creating a sustainable future that is adaptable to change and are resilient, Our workshops, community discussions and pizza dates are inclusive to those who wish to learn, teach and be humble. Thank you to everyone (community and guest speakers) for your help and support. Next season is only right around the corner, and we look forward to seeing you all on the farm. With our second season at the homestead, we are well underway to developing a healthy eco-system filled with trees, vegetables, medicine, animals and community. This spring was cool and wet but allowed us to plant over 200 trees and shrubs to establish our southern wind break, 3,600 square foot forest garden and wildlife corridor. We were also most fortunate as one of two farms to receive an Innovations Grant from the National Farm to School Network which allow us to expand our educational outreach and provide opportunities for the K-12 community in Addison County to engage with local food systems. With this award, we will be establishing a compost system with Bristol Elementary and Mt. Abe High School, providing mentorship for high school students, and working with a local illustrator to develop a comic series. As the summer season comes to a close, temperatures continue to stay high and dry, but our beds remain cool and moist with the organic matter on top protecting our soil from the elements. This marks the second year of soil prep and next season will begin a 10 year crop rotation cycle alternating heavy feeders, light feeders and nutrient givers. These beds are also located next to the pizza oven with a convenient walk to and from the field to fill the bellies of our community properly.